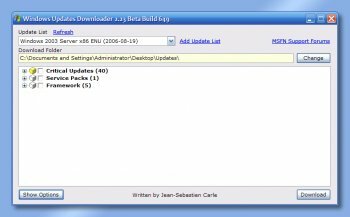 Windows Updates Downloader is a small utility that allows you to download all of the current Windows critical updates. All updates are downloaded directly from microsoft.com to your computer with a single mouse click. Hi every one! I have to say that for what the program has done so far, I am pleased with it. BUT, .........please someone...... help!! I don't understand it! It successfully downloaded 90 updates (including some for IE-8, which I do not use) The WUD program has install under C:\Program Files (just how I liked it). But the updates downloaded to a separate folder directly under C:\. It seems to me as if the update list is sitting there but they have not being installed! Doing it manually one by one, means re-starting the computer with every update (90 times!!!!!!!). Can some one help me? What should I do? I apologised for my ignorance, but one criticism of this program, and an important one, is it does not offer any guidance! Can be a good tool, but it doesn't notify that there are any hotfix-files and the downloader overwrite these files. Thank you very much for this gem of a tool, after MS killed the autopatcher project, getting updates and storing them locally became a pain. Since I do lots of formats and reinstall of OS, I need to go through the painful process of updating over a slow connection time and time again. This utility saves me all the hassles. If you don't know what a product is OR is for-- don't rate it UNTIL you AT LEAST learn something about it. SIMPLE...otherwise, it helps NO ONE. How is this different than the Windows Update Software that comes with the Operating Sytem and then is updated by MS whenever they believe it may be beneficial? Edited: Thank you Horsecharles for your excellent explanation. MS, of course, should have given us this explanation of it's use, and if it had done so, I would not have asked the above question in the first place. Because of your explanation, I have rerated this a 5 (the 3 was given in order to give it an average rating). Again, thanks. Excellent software, but outdated "Updates Lists" (ULs). This is a great idea, but when I integrated all of the updates (excluding Service Pack 1) for 64-bit Vista using vLite performance slowed to a crawl. My computer has 6GB of memory and a discrete Nvidia Ge Force 7600GS PCI-e graphics card. When I did a clean install with my RTM Vista DVD and installed SP 1 performance was considerably faster. I also did not experience any of the BSOD's related to using more than 3GB of RAM. I have Windows Professional Xp Sp3 And Office 2007 installed. URL links for Office 2007 and Windows Xp3 are also needed. @Diam0nd : I'm a gamer, I have multiple lives! 5-stars this time because the update lists have improved, and the program has lived up to its promise. You are a total retard. I've seen quite a few of your comments and ratings around here, and each and every time you totally miss the whole point. I suggest you go get yaself a life. ty. It is open, if you would like to help out, check in the forum for whoever is updating the lists you would like to help with - and start out by helping him/her.